10:00 AM to noon – clean-up of multiple sites. Everyone is welcome to join us in Johnson Park for a community celebration and picnic from 12-1:30 PM. We will provide some foodstuffs (sandwiches, chips) and beverages to share. Please bring chairs, picnic blankets and your favorite picnic treats! 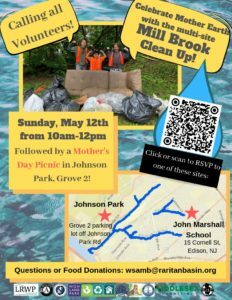 Want to learn more about Mill Brook? Check out LRWP Streamkeeper Susan Edmunds’ StoryMap photo tour of this fascinating waterway. Mill Brook: Portrait of an Urban Stream tells the story Mill Brook, a tributary of the Raritan running through Edison and Highland Park.